Can you believe it’s already the end of May? You wouldn’t believe how many times I heard that exclamation at yesterday’s Market. Tomorrow IS the first of JUNE…and it’s starting to look (and feel) like Summer around here. The planting work is in high gear, and it won’t be too long until we’re harvesting like crazy, too. I always feel just a little bit bad when I head off to town for the feed run, leaving the Boss working here on the hill. But, as he says, somebody’s got to do it. And, since he’s not a big fan of town and/or grocery shopping, the task falls to me. Because, TEAMWORK keeps this place going. I really like seeing what has changed along my route since the last time I was out. This week, it was evident that hay season is in full swing. During the next few weeks, enormous amounts of hay will be carefully harvested and stored for the upcoming winter months. Our “order” has been placed and we will be waiting for that call from our hay guy. While I was gone to town, the Boss got the okra seedlings transplanted. We have had so much trouble with corn root maggots eating the seeds in the past that we are trying transplants this year. I know, who would think that a pest with CORN in their name would eat the okra seeds? Apparently, they’re not too picky and will eat just about any seeds. We have had problems with them in the early plantings of beans, too. With the threat of thunderstorms looming, we decided to get the peppers planted and get everything mulched before planting the tomatoes. That way, we could protect the tomatoes in case of severe weather. We mulch as many plantings as we can to conserve moisture and keep down the weed pressure, using the aged, waste hay from the sheep’s winter in the barn. And, despite the amazing amounts of waste, there’s never enough. After delivering the mulch to the beds, the Boss headed off to other jobs, leaving me to finish up. Again, teamwork. He does the heavy stuff and operates machinery, I get the hand jobs that require some level of finesse. Our division of labor has kept things running on a somewhat even keel for years and years now. While the neighbors are haying, the Boss is bush-hogging and mowing. For the most part, the sheep take care of the grass. But, during the early flush of Spring/Summer, even the ewes’ endless appetites can’t keep up with the growth. As prey animals, the sheep do not graze well when the grass is tall (they need to be able to see what’s around them) and they can end up with eye problems from the grass poking them repeatedly. So pasture maintenance is important. Our property is not conducive to hay harvest…too many hills and rocks…(and we don’t have the equipment) so, the Boss mows. He deemed the front flowerbed a lost cause and bushhogged it, too. But, he did pick a pretty bouquet for me first! It makes me a little sad to give up the flowerbed, but…you just can’t do everything. and I must admit, the front yard looks much better! Signs of summer are beginning to appear…finally. It’s time for garlic scapes! For all my lamenting over the broccoli crop, there are signs of some beautiful crowns out there…and the early cauliflower looks to be the nicest ever. The leaves are tight around the little heads, protecting them from the harsh sun and will keep them bright white and also prevent “ricing”. When cauliflower is exposed to harsh weather, the heads will separate (ricing) and get a purple tinge to them. This doesn’t affect the taste in any way, but they won’t well since they aren’t pristine. But, it doesn’t look like that will be a problem this year. Now, THAT's what a baby broccoli should look like! nothin' like fresh puddle water to drink! Friday afternoon brought a huge, unexpected thunderstorm. While I’m pretty sure the local hay guys weren’t real happy, we really needed the rain. It was getting a little dusty around here. We measured 1 ¼ inches of rain in the gauge in just over an hour. We won’t need to irrigate for a couple of days at least. After the rain, it was a beautiful Market day. (the humidity didn’t build until later in the afternoon) Good music, lots of folks...that makes a good market. Check out this week's photos on Facebook. Those garlic scapes certainly didn’t last long! I’ll have to head out and harvest the rest real soon. The first load of lambs will be heading out to the processor this week, too. That means that we’ll have lamb chops (and all the other cuts) for the Market in about two weeks. Good timing! The freezer is just about empty. but, it's so pretty...and smells so good! Come back and “visit” us again real soon. I have to admit, every year I approach shearing day with a fair amount trepidation. And, not without warrant, I might add. The combination of hard physical labor, sharp objects and unpredictable animals is a perfect breeding ground for disaster. Mutton-busting sounds amusing, but honestly, wrestling with frightened prey animals is not only NOT fun, it can be dangerous. 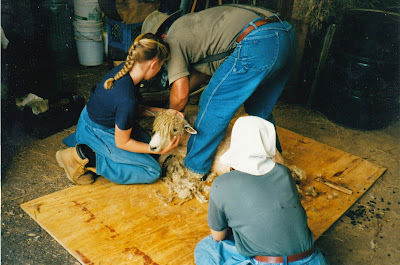 Years ago when we had the woolly sheep, the shearing process was a huge ordeal. (yes, most sheep ARE woolly...but, some are bred for wool and some are bred for meat) The entire family got involved, it took the entire day, and by the end, everyone…including the sheep…was in a bad mood. As we still had all the smelly wool to contend with. One time it was not a family affair and the Boss and Blondie decided to clip a few sheep out while Toughchick and I were in town. We arrived home to hot and grumpy people (and sheep) and the Boss trying to explain the bloody clipper marks in his arm. If you look closely, you can still see the little triangular scars more than ten years later. Fortunately, that was a one-time occurrence! Over the years we have gotten far better at the entire event, but there is always the possibility for trouble. But, we've managed to keep damages to a minimum. 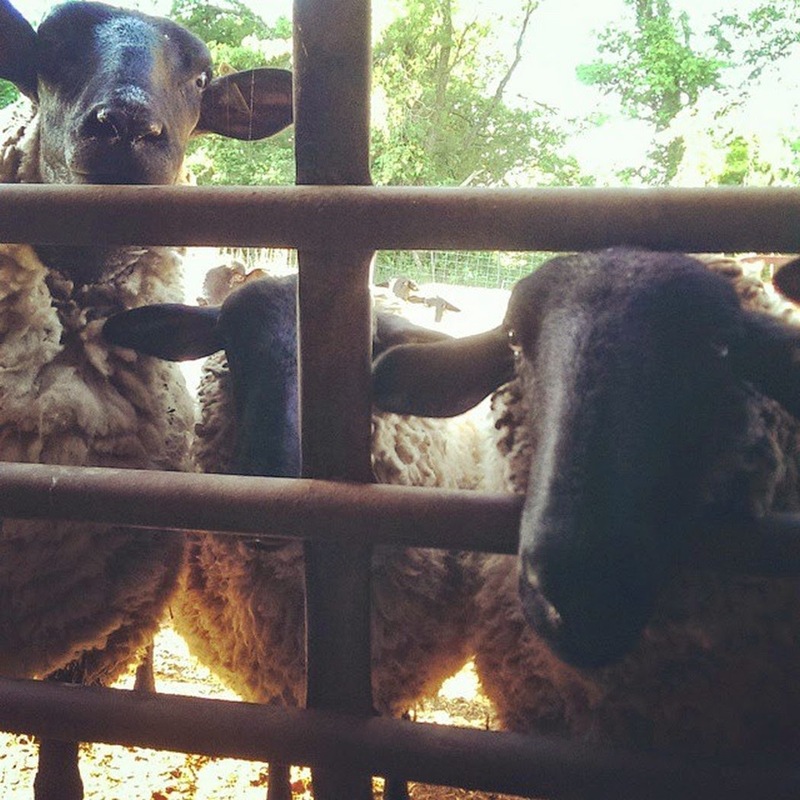 Since 2008, shearing day has been a mother-daughter bonding experience. Blondie and I made a tradition out of our Memorial Day shearing and I didn’t consider how different this year would be without her, until the other evening. “I’m really sorry I’m going to miss our annual thing.” Her voice had an odd little catch in it. You can read about our past shearing "adventures" HERE. (there are links to the past five years, I think) This year, Blondie is six months pregnant and shearing the sheep was simply out of the question. Suddenly the realization that the experience would be very strange this year hit me. The worry over the Boss’ somewhat problematic back set in. (all that bending and “mutton-bustin’” wouldn’t help matters). Oddly enough, despite all the teamwork around here, the Boss and I had never even attempted this particular job together. Unbeknownst to me, the Boss was also more than a little concerned about the whole ordeal as well. But, the job had to be done, so…we kept kept our concerns to ourselves and got on with the job at hand. By tying the sheep off and not laying them down, the Boss saved himself (and his back) the physical torture of wrestling the sheep while clipping them. The end result is not quite as pretty and requires a little trimming up afterward, but the main thing is to get the wool off the sheep so they can be cooler during the heat of the summer…and we did that. With the exception of the next to last sheep (who totally and utterly freaked out...but, we got her done anyway), they all behaved fairly nicely. We got their hooves clipped and the de-wormer administered and turned everyone back out into the lush green grass. No serious injuries to humans or sheep…that definitely counts as a win! Yep, the old folks still got it! I must admit, there was more than a little Ibuprofen administered around here last night and the heating pad saw some action. …and we will all be glad for Blondie to resume her duties next Spring. Years ago, the Market was a far different experience than it is today. Most of the clientele was older folks who had made their way to town after spending their youth in the countryside. They were used to red tomatoes, yellow corn and white potatoes. Food wasn't supposed to be trendy and cool, it was just fuel for your body. The second little old lady was still muttering about blue potatoes as the pair made their way down the sidewalk. I know, I know, you’re wondering WHAT in the world that has to do with our weekly farm tour. I can honestly say that despite years and YEARS of farming and gardening…I ain’t never seen NOTHIN’ like this year before... We have experienced issues with the weather, pests and disease that are unlike any of our past experiences. But, don't get me wrong...I am NOT complaining. Sometimes, when I re-read what I’ve written or I read the comments that folks leave, I wonder if folks get the feeling I’m complaining or detailing a litany of failures. That is definitely NOT my intention! While it sometimes seems that nothing is going the way I planned it, or how we may have expected, the reality is this place truly is profitable and successful. Even the “disasters” grant us learning experiences. ...and while everything, from the weather to the market (and everything in between) seem hard/weird/different than ever before…we are actually ahead of last year’s earnings! Monday was a hot, steamy day for processing broilers. Summer had arrived with absolutely no warning. You could see the thunderclouds building in the west. But, with the broilers processed and in the freezer, we decided I should head to town. If I hurried, I could get the food/feed/bank run done and Tuesday would be a day of uninterrupted planting/weeding/working. Raindrops started falling from the sky just before the feedstore fellas started loading the truck. “So…whatcha want to do about this?” they asked. A quick check of the radar on my phone and I decided to take a chance. (I really didn’t want to have to haul out the tarp from behind the seat) They exchanged knowing glances, but loaded it anyway. Before I left, the sun was shining brightly once more. They laughingly said “well, you was right!” as I drove away. It was going to be a close call to get home and unload before raindrops fell again…but, I made it! We did get a big storm that evening that cooled things off slightly. But, it looked like we were in for a run of heat and humidity. After breakfast, we moved batch #3 of broiler babies to the pasture pen. Pretty much the same old, same old there. Did you read the post about broilers? We planted and mulched in the first cucumbers. Some of the plants had teeny, tiny cukes on them, so we are not that far away from the first pickles and salads of the summer. But, only if we beat the cucumber beetles. I have never seen the beetles appear so very quickly. I think they were waiting for the plants! We also got the first of the summer broccoli planted. Hopefully, this will fare better than the early broccoli. Sadly, the early broccoli crop is going in the fail column this year. It is, at best, a great disappointment. At least a third of the plants finally succumbed to the relentless, cold wind that lasted for at least three days several weeks ago. (never had that happen before!) Another third of the crop “buttoned-up”. This happens when the plant is stressed and makes a head long before it should. This causes the crown to be quite small. For the record, once a broccoli plant makes a head/crown, it will only get to a certain size before it turns into flowers. You can’t leave the little heads hoping they will grow. That’s the first time in about 10 years of planting early broccoli that we’ve ever had THAT problem, despite freezing temperatures and snow on the plants. Never seen nuthin’ like it! Before I could get to the “after lunch” jobs, the phone rang. It was the Staunton Post Office requesting that I come to town and pick up the next batch of chicks. I must say, it was a good thing that Gus and Ellie helped get the brooder cleaned out earlier in the day! the corn gluten applied to this onion bed really kept the weeds down! I must say, I totally understand the use of pre-emergent herbicides. And, no, we don’t use them. Corn gluten helps…some. (there are lots of variables in application and efficacy) But, for the most part, we are pulling a LOT of weeds. While this does work and I guess we can be glad for the time of thought and meditation, it does cut down on our productivity AND if we don’t keep up with it, plant health is greatly impacted, ultimately affecting yields. The Boss tilled and hilled the potatoes. The tilling cuts down on the weed pressure and the hilling loosens the soil, allowing the tubers to grow larger. He says we’ll have “new potatoes” in a couple of weeks. While I have my doubts about the timing, the potato crop looks like one of the best we’ve had in a long time. Later, while I was working in the hoophouse, I saw the Boss head out the lane on the tractor. I didn’t give it much thought until I saw him WALKING back a short time later. It seems the tractor had a flat tire. When the tractor has a flat, it’s not generally a matter of just putting a little air in the tire. And, this time was no exception. Three tire shops, at least two phonecalls, a lot of frustration and a minor roadtrip, and the Boss was back in business. …nope…never…before… On the bright side, the new tire was far less expensive than I feared! But, you know what...I can't tell the old one from the new one. Can you? With the daily thunderstorms came big changes in the weather. I mean BIG changes. We went from temperatures in the eighties to barely getting out of the forties. The unseasonably cold weather in late May when the berries are in blossom is often referred to as “Blackberry Winter”. It is thought that this weather phenomenon is actually necessary to good berry production. While I cannot attest to the truth of that statement, I can tell you that if the blossoms are any indication, the blackberries, black raspberries and wineberries will be in great abundance this year. Now, if we can just beat the birds (particularly the blasted crows) and the resident bear of Mbrk to the harvest! There was a Black Angus bull wandering down the road. He was bellowing away, looking for some “ladies” and wasn’t even slightly interested in going through the gate the Boss opened. Since chasing bulls can be more than a little dangerous, (and we really didn’t know where he belonged) we left him to his search for “love”. He was last spotted walking up toward Jr’s carport. Hopefully, he went on toward the ballfield and the fire department where someone could direct him back home again. Pretty sure we'll hear an update next time we go to the Post Office! Although, as a kid, I distinctly remember a cow walking up to the front door. And, my all-time favorite neighbor story involves another wandering cow. Read THIS. The Market was good…lots of people, good music and pretty weather. Now, it’s time to re-group before getting back at it tomorrow. Because, it doesn’t matter that tomorrow is Memorial Day. The holiday gets little recognition here on the hill. Although, it has been our annual shearing day a number of years. This year promises to be slightly different. Since Blondie (our usual shearer) is six months pregnant, the job will fall to the old folks this year. There might just be a blog post in that one, so stay tuned! In the meantime, have a Happy Sunday! Thanks for stopping by…come “visit” us again real soon!